What a week – I still feel jet-lagged from two back to back trips. While I was in Tokyo last week though I decided to go to my first Japanese Anusara Inspired class. I surprised my friend Misato Tomiyoshi ( Top of the photo) I had met in November at John Friend’s teacher training in Tokyo. I had watched her do a demo teaching at the training and knew she would probably teach a wonderful class- and she did! I checked out Studio Yoggy’s Iidabashi location for her Inspired class. The funniest part was when I walked in Tomoko Oda was there- another Inspired teacher and friend who lives in Osaka. I had no idea she would be there- it was a nice surprise. Misato does not speak much English but even if you don’t understand Japanese you can feel what she is saying. She started with a clear centering and explaining how “no matter our level when we come to the mat we all start at the same place- the same line. Beginner or seasoned practitioner our only difference as we move through the practice was how deep we would refine the poses. Our experience was equal no matter our outside abilities.” Great theme. I have to mention the invocation. Everytime I do it in Japan it is so much better than here. They are soft and harmonious- no off key or overly loud voices. I wish I could get my class to sound as good! We went straight to handstands after warm up – which didn’t go so well with me and my jet lag ( we practiced at 3:30 in the afternoon which was 11:30 at night for me- wee bit dizzy and weak). Madoka- another teacher I met in November- and I helped each other and I was blown away to discover she speaks perfect English and she used to live in Canada! She has sat and listened to me struggle through so many conversations in Japan. I would be searching for the right words and she would maybe throw in a word in but never switched to English. I guess she figured for the sake of others around us that only speak Japanese, we might as well stay in the language- or she doesn’t want me to lose face by “translating” for me. Either way it is such a Japanese thing to do. After a few standing poses we went to backbends and then to seated- I liked that. I find backbend practice at the end hard. For me back bending takes an enormous amount of energy, and I am pretty zapped by then. I may borrow that as well! Misato has good observation and she caught my tendency to not work my shins in the seated poses-twice! Oops! We ended with another centering and a beautifully long savasana. All in all well worth the 3000 yen ( $30 Canadian) for the drop in. I thought of it as a teaching experience rather than just a class and that helped justify the price. They have multiple class passes for much better rates. The Studio Yoggy is also part of LOHAS– Lifestyles of Health and Sustainability- so the studio highly promotes green living, sustainability, and recycling- something not very predominant in Japan yet. The other thing that Madoka informed me about was Anusara now had a Japanese web site- www.anusara.jp. It is so great to see the growth of Anusara in Japan and around the world. Thank you again Misato and Madoka for such a wonderful afternoon of yoga- hope to see you in June! Arigatou gozaimashita. Mata yoroshiku! I spent this layover again on a train..and a bus..oh – there was a taxi in there too. Literally planes , trains and automobiles. 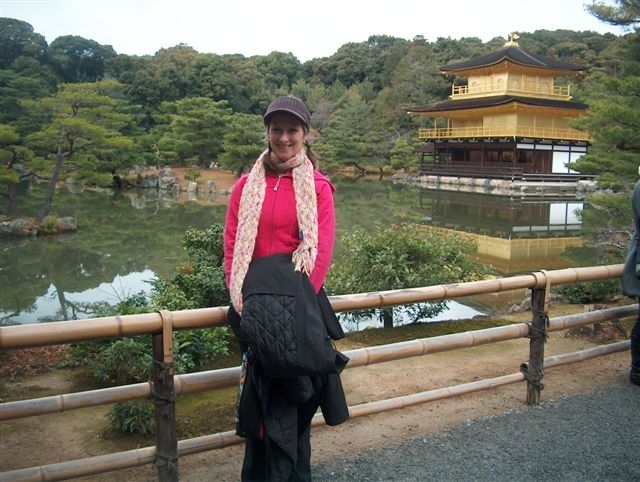 Kyoto called me back once again and I decided I should really go see the Golden Temple as during all my previous trips to Kyoto in the last 24 years I have never managed to make it there. 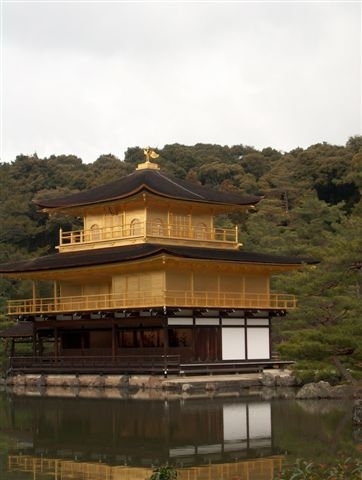 Kinkakuji- as it is known in Japan-must be one of the most photographed landmarks of the country- almost everyone in North America who has had any remote interest in Japan has seen a picture of it. Some of my favorite pictures of it are ones taken after a heavy snowfall in Kyoto- very rare. I would love to see it in the snow. So in very cold weather I bundled up after morning yoga practice at hoped on the train. I am currently reading a copy of the Bhagavad Gita called The Living Gita by Sri Swami Satchitananda. It’s great because it’s like having a teacher lecture you as you read the actual Gita. He has some good metaphors to explain the Gita in simple terms. So as I rumbled along in the train I noticed the sky getting fuller- not darker exactly – but more fluffy. When I got off the train and was waiting for the bus, I started to see little flashes of white- like ash- drift one at a time through the empty air. I followed one down to it’s resting place on the sidewalk and watched it melt away. Snow. It was snowing in Kyoto! I was filled with that whole “dance around and clap your hands like a little kid” feeling. But I didn’t- I just kept it inside and let a huge grin spread across my face. Thirty minutes later I was at Kinkakuji. I have to say the bus system for foreigners in Kyoto is excellent. You can get to any major landmark by buses that are marked in Japanese and English and some are on continuous loops of just the tourist areas. It cost 220 yen to ride the bus but you can buy a day pass for 500 yen and get on and off as much as you like. 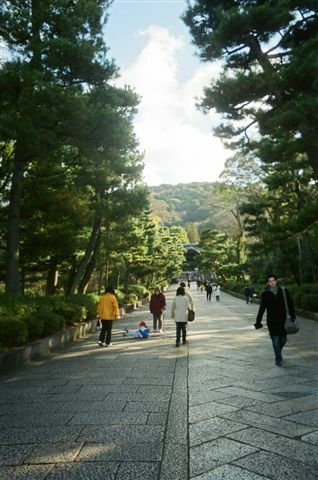 The entrance to Kinkakuji was a lovely stone pathway with moss covered forest on both sides. I paid my fee- received a very interesting entry ticket ( it looks like a Japanese scroll) and made my way in. As soon as I rounded the first corner it presented itself to me. It looked more gaudy yellow in the distance than gold- but then I walked closer. My throat actually tightened. It was beautiful. I had seen so many pictures of it but to see it in person took me back a bit. Closer up it didn’t look yellow at all- it was truly golden- and it’s mirror image was perfectly reflected in the still pond. 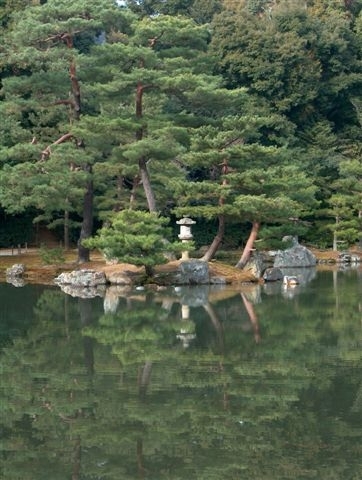 Kinkakuji was built by a Shogun- a head of state during the time of samurai- as a retirement villa in 1397. 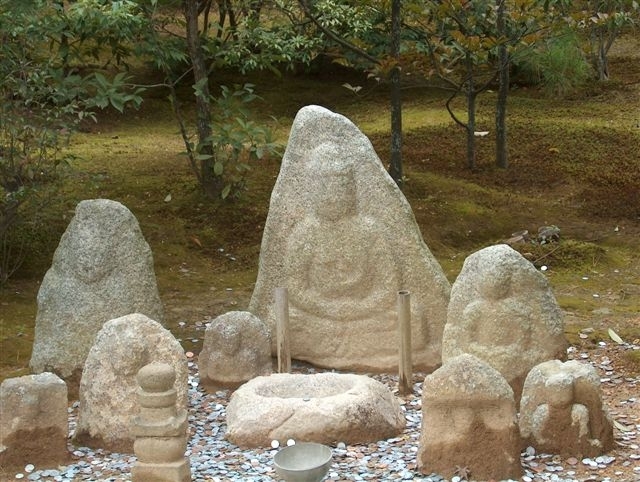 After his death is was left to the Rinzai school of Zen Buddhism. The temple has been burned down and rebuilt many times. 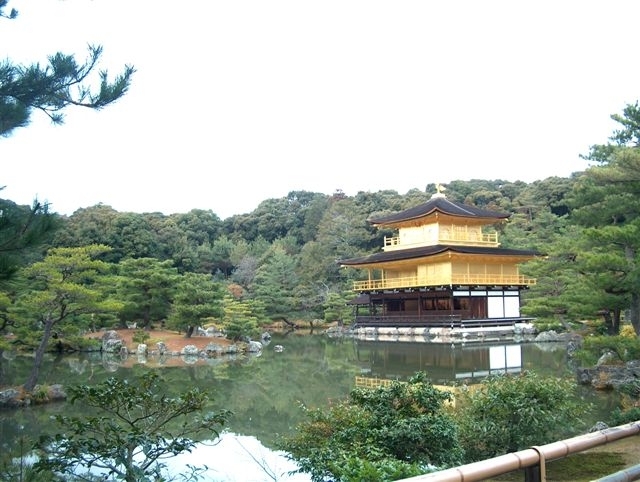 The top two stories of the pavilion are covered with pure gold leaf. The pavilion functions as a shariden, housing relics of the Buddha. The pond in front of it is called Kyōko-chi (Mirror Pond). 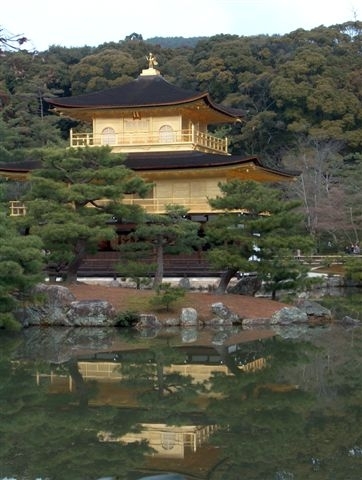 It really does reflect, almost perfectly, the temple and trees around it. I immediately thought of the phrase we use of “the mirror of the heart”. When Maya or illusion is erased we can see clearly our true nature. There was nothing in that pond to muddle the reflection- no ripples, no movement. That is probably why we need stillness in our heart and mind as we practice- to become so still like this pond in order to see ourselves clearly. The reflection in the pond was no less stunning than the reality of the temple beside it. I hesitated to look in to the pond myself- what would such a mirror show me? I started conjuring up images of the stories of Shiva and the mirror- so maybe I didn’t really need to look. The mirror pond had already shown me so much. I spent a half an hour staring at the temple and watching flakes of snow dance temptingly in the air but none of them survived the fall. 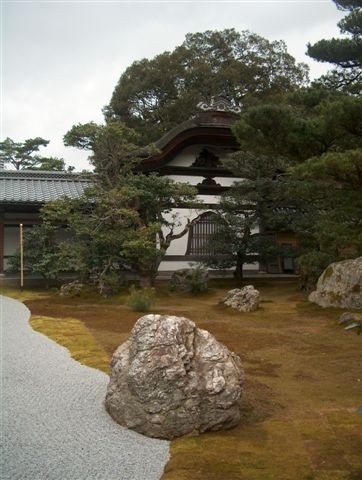 No snowy picture of Kinkaku-ji for me. I had manifested snow- just not enough. Isn’t that always the way- you get something and you get greedy and want more. I said thank you for my snow- no matter how tiny- and said to the Universe that I was thankful for even that little bit. 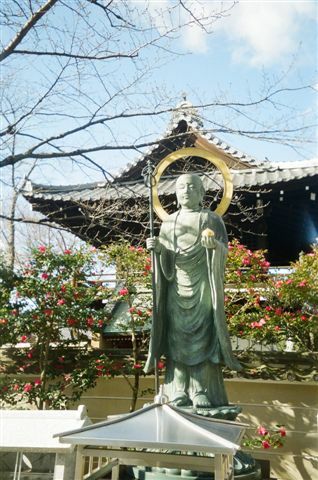 I left Kinkaku-ji very satisfied and hopped a taxi to investigate a local inn that might accommodate a group of yogis….but that is another blog. Well the new year has started and I am still struggling with an achy hamstring. My yoga practice has been drastically cut back and I am becoming a bit frustrated. I have decided to take the focus off my legs and put it in my back and arms. So backbends and inversions it is- I am trying spend at least 10 minutes a day on “the chair” trying to open up my back and working on long handstands and headstands. The chair I use is a basic folding chair that I put on a mat and push up to the wall with the back of the chair facing the wall. I then thread myself through it so my feet on on the floor close to the wall and my bum is on the chair seat and I can bend back over the seat to touch the floor. I often like to thread my arms through to the back cross brace of the chair to really work on the front of my shoulders-especially my deltoids. I have about a month to get myself into a good working form as John is in Seattle on Feb1st and the White Rock kula is going down for the weekend. There is nothing worse than not being able to fully participate in such a fun event. I spent New Years eve day walking though Kyoto. I was so tired that morning. After a few minutes of yoga, I suddenly felt inexplicably pulled out the door of my hotel. I had talked to some of my crew about going to Kyoto but had been mostly talked out of it by the cold local weather and the deep desire to rest after 10 days of continuous flying. Before I knew it I had a book in hand and was sitting on a train to Kyoto. I swear I looked up at one point and said to myself ” How did I get here? ?” It was like something had literally put me on that train before I had time to think. I have never gone to Kyoto on a 24 hour layover so why now? Then it came to me- it was December 31st. It was the anniversary of my father’s death. Apparently Dad wanted me to take him to Kyoto. How can I describe such a perfect day? When I got of the train it was cold and crisp with the bluest sky. My scarf and gloves made it very comfortable and the sun warmed off the worst of the cold. I had a tin of hot coffee from the vending machine in my pocket as a hot water bottle and I set off on my walk. Japan in the winter is clear and fresh- not raining and dark like Vancouver. The willow trees still had leaves and the red and pink camellias were in bloom. I started my walk at Yasaka Shrine in the Gion District. Its bright red and green colours are like a beacon at the end of road. 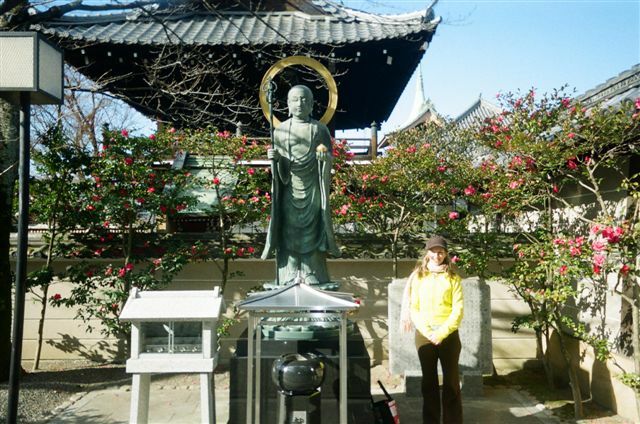 I stopped there to pray to the Shinto gods- the animistic gods of Japan that are said to reside in every living thing. It relates well to the idea in Anusara that everything has a pulsation- and we are all connected to that same greater pulsation- a divine current. 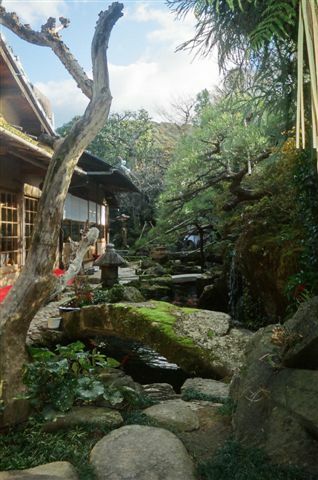 You feel it when you look at the gardens surrounding the shrine- every tree and rock radiates a life force- a beauty. 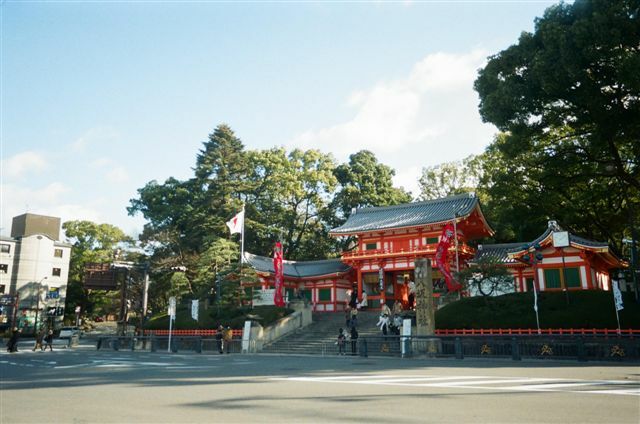 As I exited Yasaka Shrine I started to head towards the Buddhist temples. There are a multiple of them on the climb up Higashiyama – the most proliferous and popular temple area in all of Japan. Giant paving stones and hundreds of year old pines mark some of the pathways and entrances to these places- you can feel the ancient wisdom that pervades this area. Even though the area is crowded visitors, there is a stillness to the place. 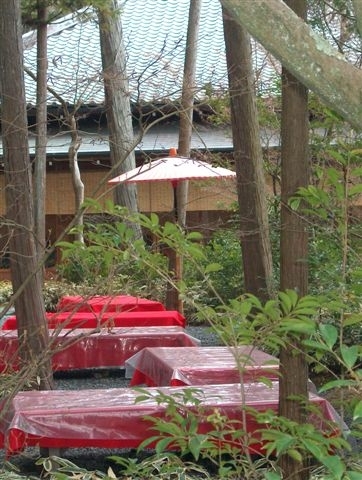 After making offerings and praying at these shrines I move further up the mountain. The cobblestone street is lined on either side by small shops and teahouses selling trinkets and food of every variety- old style umbrellas, fans, pottery, masks, dolls, bamboo toys, incense and prayer beads. 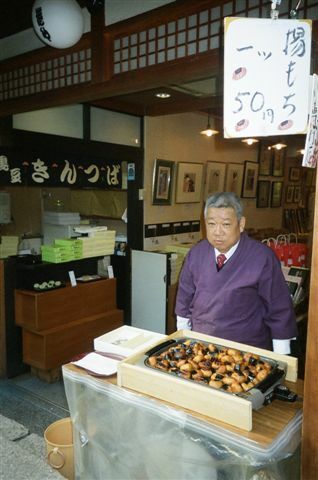 Whole shops are dedicated to pickles- you wouldn’t believe how many types of pickles there are in Japan!- and Kyoto sweets made with sticky rice and sweet beans. I am not much of a shopper and I think in my years in Japan have bought most of the knickknacks that they have to offer but I still marvel at the variety and colour. I think of all my friends I have yet to bring here and how much I want to share this with them. I somehow have to get a yoga retreat happening in Japan in the next couple of years just to share this with everyone. 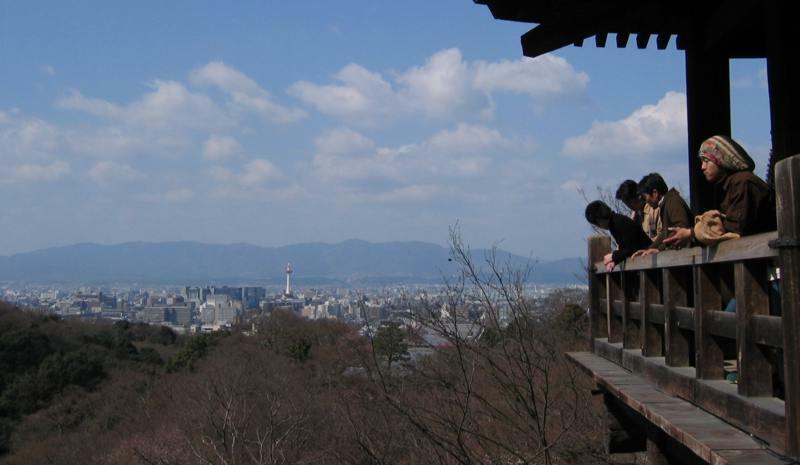 When I got all the way to top of the hill one of the most amazing temples in Japan was waiting for me – Kiyomizudera. The temple dates back to 798 but the present buildings were constructed in 1633. The temple takes its name from the waterfall within the complex, which runs off the nearby hills. 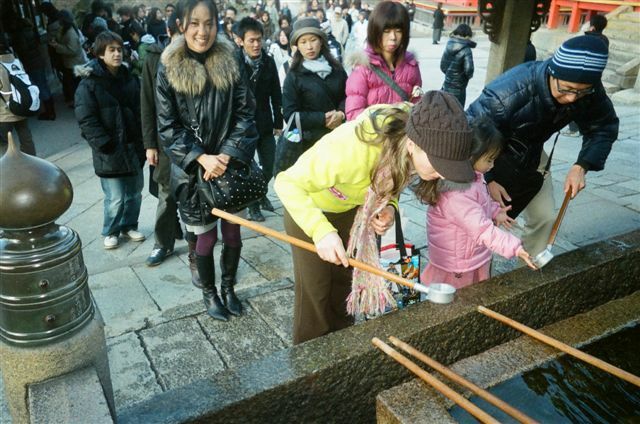 Kiyomizu (清水) literally means pure water. I have always felt a deep connection to this particular temple. The first time I went there I was 15 and it has never failed to impress and humble me. Before I enter the main part of the temple I go through the ritual cleansing. I step to the fountain at the entrance and fill the ladle with water rushing from the dragon statue’s mouth. I first wash my hands and then I drink and rinse my mouth. After this I then enter the main part of the temple. 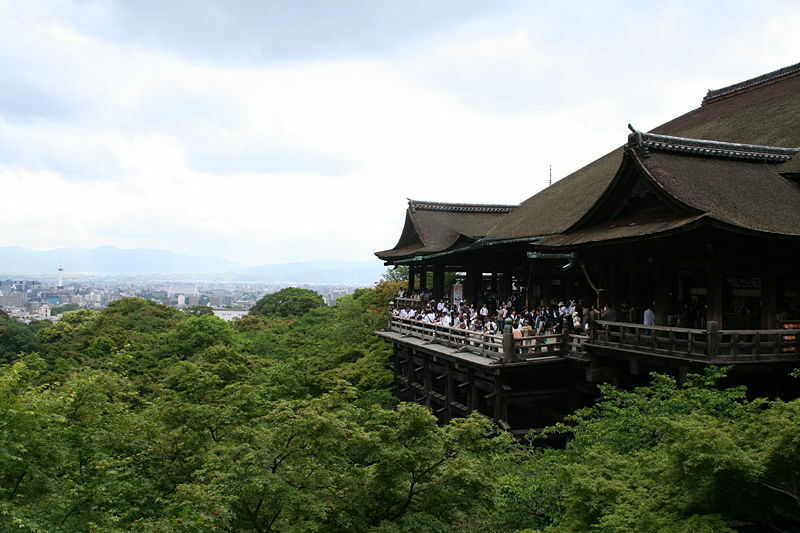 The veranda on Kiyomizu is famous- from this raised platform you can see most of Kyoto. I have seen that panorama in the cherries of spring, the humidity of summer and the fire colours of fall. This was the first time I had seen it in winter. It was so clean and bright- refreshing to the eye and body. Breathtaking. I have never seen anything worse than “curse” but who knows- they must exist! After a few final wanderings I made my way back down the mountain for lunch and the ride home. I didn’t practice yoga that day like I had planned to but I practiced it deeper than I thought possible. I noticed every colour, smell, and sound around me. I was so aware- so present. I was so full that day- my senses were so completely satisfied and my heart was so calm and peaceful. I hope my dad enjoyed Kyoto as much as I did- I thank him for pushing me out the door.